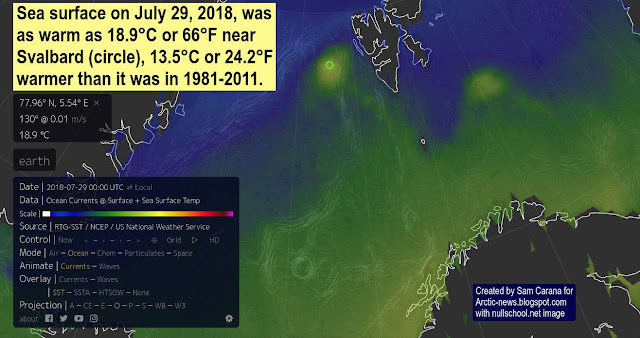 Sea surface temperature near Svalbard in the Arctic was 18.9°C or 66°F!! On July 29, 2018, the sea surface near Svalbard was as warm as 18.9°C or 66°F (at the green circle), 13.5°C or 24.2°F warmer than during 1981-2011. On July 17, 2018, the sea surface off the Florida coast was as warm as 32.9°C or 91.2°F (at the green circle), 3.2°C or 5.8°F warmer than during 1981-2011.